By Tim Royner: Oleksander Usyk vs. Alexander Povetkin is still a possibility for May 18, according to promoter Eddie Hearn, but he says Carlos Takam is also a possibility for Oleksander on that card on DAZN. If Usyk strong faces the 38-year-old Takam in his heavyweight debut, Povetkin would then fight 2012 U.S Olympian Michael Hunter on the undercard. Hearn says Povetkin (34-2, 24 KOs) would prefer to fight someone else next rather than Usyk (16-0, 12 KOs). That’s not surprising, though, as Povetkin, 39, is coming off a seventh round knockout loss to Anthony Joshua in his last fight on September 22. 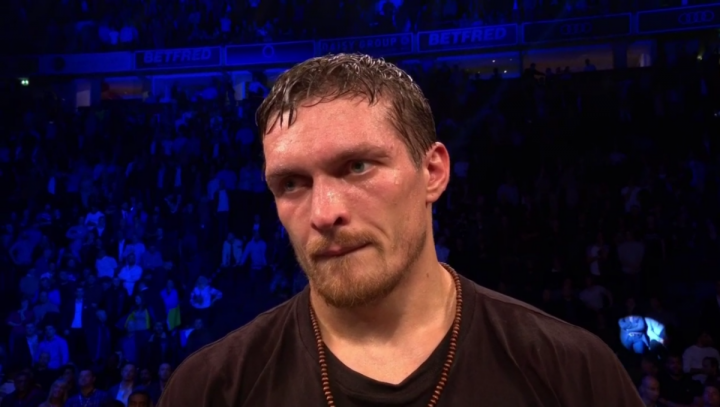 Usyk isn’t a good bounce back opponent for a fighter that is pushing 40-years-old, and hasn’t beaten a quality fighter in two years since his victory over Christian Hammer in 2017. Povetkin’s only wins since then was against domestic level heavyweight David Price in 2018. “We’re looking at Povetkin, Takam, and other guys,” Hearn said to IFL TV. “If he doesn’t fight Povetkin, Povetkin will be on that card fighting probably [Michael] Hunter, and then they’ll [Usyk and Povetkin] fight each other next,” Hearn said. Takam (36-5-1, 28 KOs) is starting to look really shot at this point in his career. If this is all Hearn can get for Usyk to fight for his heavyweight debut, then there’s nothing that can be done about it. Takam has been knocked out in 2 out of his last 3 fights in defeats against Dereck Chisora and Anthony Joshua. A last minute replacement opponent for Kubrat Pulev, Takam was stopped in the 10th round by Joshua in October 2017 at the Principality Stadium, in Cardiff, Wales. Takam was competitive in the fight, and even hurt Joshua on a couple of occasions. The fight was marred in the 10th round when the referee Phil Edwards suddenly jumped in between the fighters seemingly for no reason and stopped the fight, giving Joshua a knockout victory. It was very strange, and tainted the victory for Joshua. Takam was beating up 35-year-old Chisora last July when he got caught with a shot to the back of the head, and dropped in the 8th. Takam got back up, but was put down a second time for a stoppage loss. Takam won his last fight in beating little known Senad Gashi by a seventh round knockout last December. “Povetkin would rather have a fight, and then fight him,” Hearn said about Povetkin preferring to have a tune-up fight next before he faces Usyk. Michael Hunter (16-1, 11 KOs) could give Povetkin a lot of problems with his high work rate, and his strong chin. This is a fight that could wrong for Povetkin, who was shaken up by David Price in the third round of their fight last March. Povetkin was able to score a stoppage in the fifth round after Price gassed out. Povetkin hasn’t looked good in a fight since his win over Johann Duhaupas three years ago in 2016. Povetkin’s once impressive is gone, and his stamina looks like it’s taken a hit as well. Provided that there’s no controversy in terms of the scoring, Hunter has a good chance of beating Povetkin if that fight takes place. It would be a shame if the scoring is wack for that fight. With a big money match between Usyk and Povetkin just over the horizon, you can argue that it could bear impossible for Hunter to get a win over Alexander. Hopefully we don’t see Povetkin beating Hunter by a controversial decision on May 18, but it wouldn’t be surprising. Usyk vs. Povetkin is a big fight. If Hearn doesn’t want to potentially mess up that fight or taint it by having Povetkin coming into the match off the back of a controversial decision win over Hunter, it might be better for him to select a lesser talented heavyweight for Alexander to face on May 18, if he doesn’t fight Usyk on that date.